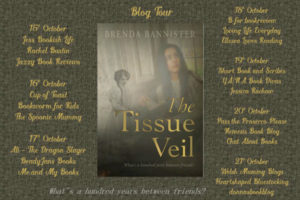 Welcome to my stop on the blog tour for The Tissue Veil by Brenda Bannister. I have my review to share today along with a lovely guest post by Brenda about how the book came about. My thanks to Rachel Gilbey from Rachel’s Random Resources for the place on the tour and for providing a copy of the book for review. What if you discovered a hundred-year-old diary under your floorboards – and then found references in it to yourself? Or if you lived in 1901, yet kept seeing glimpses of a girl from modern times? And what if both of you had problems that only the other could really understand? Emily and Aysha live in the same Stepney house and an inexplicable link develops between them, fuelled by Aysha’s discovery of a journal and Emily’s sightings of a ‘future ghost’. Each takes courage from the other’s predicament – after all, what’s a hundred years between friends? The Tissue Veil is a dual timeframe novel, but one with a difference. The book starts off with Emily’s story. It’s 1901 and Queen Victoria has just died. It’s a period I find interesting to read about and I really liked this opening chapter where we witness Emily and her mother going to watch the funeral procession. But tragedy is in store for Emily’s family. We then switch to Aysha’s story in 2000/2001, so a hundred years later. She has a fairly standard Muslim family set up, with several generations living under the one roof, the very same one Emily used to live under. In fact, Emily’s bedroom is now Aysha’s and it’s there that Aysha discovers Emily’s journal. Here’s where it gets a bit more unusual. The title alludes to a veil between time and the two young women find that being a hundred years apart doesn’t necessarily mean they can’t see each other or find a way of communicating. I loved this aspect to the book – not quite time travel but an interweaving of time. And there are many parallels between the two women’s stories. The restrictions that Emily finds placed on her and the role of women in society in her time, are mirrored in Aysha’s own family set up. I particularly liked the fact that it was one chapter for Emily and one for Aysha throughout the book and so the parallels were really obvious. Each woman has their own difficulties to contend with, both from their families and in their romantic lives, friendships that see them through and those people who are out to see them fail. Ultimately though, it’s heart-warming with a conclusion that I particularly loved. It’s a really interesting story, with plenty of social history within it. It’s well-researched, both from the historical angle and also the cultural set up. One little niggle for me was the length. I thought it was a bit on the long side and would have liked to have seen it condensed a bit. Overall though, I enjoyed this intriguing and well-written book and thought it was a great debut novel by this author. I’m delighted to be featuring on your blog (love its name!) as part of my blog tour for The Tissue Veil and to tell you something about its inception. 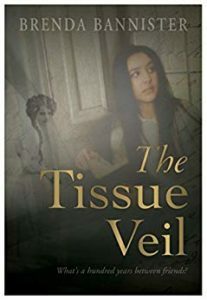 The East End of London, past and present, provided the initial inspiration for The Tissue Veil, but it took a move to Somerset to bring it to print. The novel’s setting is both historical and near-contemporary, as it charts the coming-of-age of two young women, telling their stories over two time frames. Edwardian teenager Emily’s story takes place in the opening years of the twentieth century; Bangladeshi ‘A’ level student Aysha’s in the twenty-first. The two girls ‘share’ a bedroom in the same Stepney house; both are under pressure to get married; each must defy her family to preserve her independence. I spent eighteen years working as a college librarian in Tower Hamlets, a place where old and new exist uneasily side by side, and often found myself wondering about the original residents of those Victorian houses that had survived the Blitz. What were once prosperous family homes had been split into flats whose occupancy reflected the multi-racial population of the borough. Somehow, in the gap between these worlds, the seeds of a story took root. I’d always loved time-travel themes in both children’s and adult literature – everything from Tom’s Midnight Garden to the novels of Kate Mosse — so, while The Tissue Veil is not exactly a time-slip story, the girls’ stories are linked by more than location and a common theme. The book has at heart a mysterious, time-defying link between the two main characters, fuelled by Aysha’s discovery of a journal and Emily’s sightings of a ‘future ghost’, posing the questions: What if you discovered a hundred-year-old diary under your floorboards and then found references in it to yourself? Or what if you lived in 1901, yet kept seeing glimpses of a girl from modern times? And what if both of you had problems that only the other could really understand. Each girl takes courage from the other’s predicament – after all, what’s a hundred years between friends? I hope that the two stories illuminate each other, showing how some things — but not all — have changed for women. The girls are both intelligent and ambitious, but I think Emily, although younger, is the more resourceful, perhaps reflecting the changing times of our grandmothers and great-grandmothers, when many youngsters left school early and were expected to help in the home or work. Aysha shares my own love of literature and history, but also my tendency to procrastinate: she avoids confrontation and puts off discussing her university application with her parents — with disastrous results. Like Emily, my grandmother lost a family member to the Boer War, in her case her father. I remember her visiting the cemetery where her mother and step-father were buried, and her own father was commemorated on their headstone. Colleagues, friends and students from the Bangladeshi community inspired both Aysha’s extended family and aspects of college life in the book. I grew up in the 1950s and 60s and the Edwardian world was still in the living memory of older relatives and a source of anecdotes. The ‘modern’ story is set in the early 2000s for several reasons, but it’s still scary to realise that in 2001 today’s young reader of Emily’s or Aysha’s age wouldn’t even have been born. Thank you so much, Brenda. It’s really interesting to see where the idea came from for the book. And thank you also for your kind comments about my blog’s name. Brenda studied English at university and later qualified as a librarian, working in various educational settings from schools to higher education. Moving from London to Frome in Somerset in 2010 proved a catalyst for her own writing as she joined local fiction and script writing groups. She has had a number of short stories published, plus short plays produced in local pub theatre, but all the while was incubating a story based in the area of Tower Hamlets where she had worked for eighteen years. This germ of a story became ‘The Tissue Veil’. Brenda is a founder member of Frome Writers’ Collective, an organisation which has grown from a handful of members to over a hundred in the past four years, and helped set up its innovative Silver Crow Book Brand. 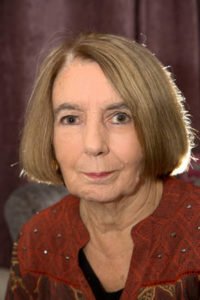 She is also the current organiser of the annual Frome Festival Short Story Competition. A lifelong reader, Brenda rarely follows genres, but enjoys modern literary fiction, historical fiction, classics and the occasional detective novel. The latest Bernard Cornwell might be a guilty pleasure, but she’ll be even more eager to get her hands on Hilary Mantel’s final instalment of Thomas Cromwell’s story.